Sweet and savory, this quick-fix figs and prosciutto appetizer might just become a go-to favorite in your repertoire of simple yet gratifying meals! The warmth of the tomato perfectly pairs with the sweet tang of the figs and prosciutto. Drop the tomatoes in boiling water, then after 2 minutes drain and skin. Cut into quarters, remove the seeds, and place on an oven proofed sheet pan lined with greaseproof paper. Season the tomatoes with the zest of the citrus fruits, 6 crumbled bay leaves and thinly sliced garlic; bake for 60 minutes. Remove from the oven and let cool. Once, cooled cut into small fillets. Cut the shallot into very thin slices and put in the oil with a pinch of oregano. Leave to rest for at least 4 hours. Sprinkle the bread slices with the aromatic oil, salt and pepper. Toast in the oven. Top with the tomatoes, and complete with a drizzle of olive oil and some basil leaves. Meanwhile, halve the figs and thread them on skewers. Grill them on a hot plate. 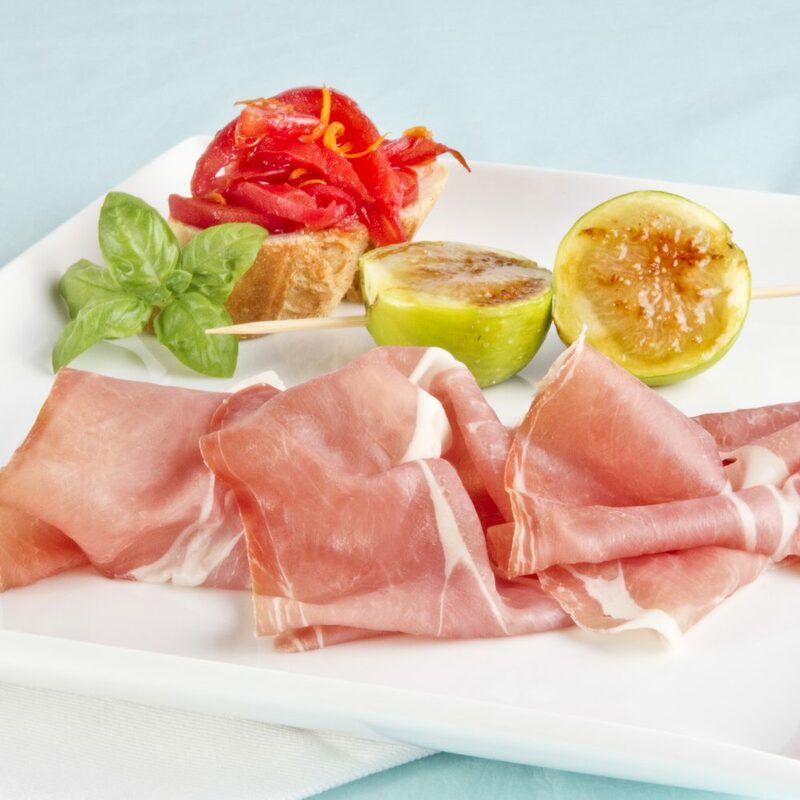 Arrange a couple slices of Prosciutto di Parma loosely in the center of a plate; add a fig kebab. Place a canapé and basil leaves on the side and serve.